The more you post the better your chances to win….. Check out www.lavantgardehair.com for all of our Avant Garde Styles…. NO PURCHASE NECESSARY. 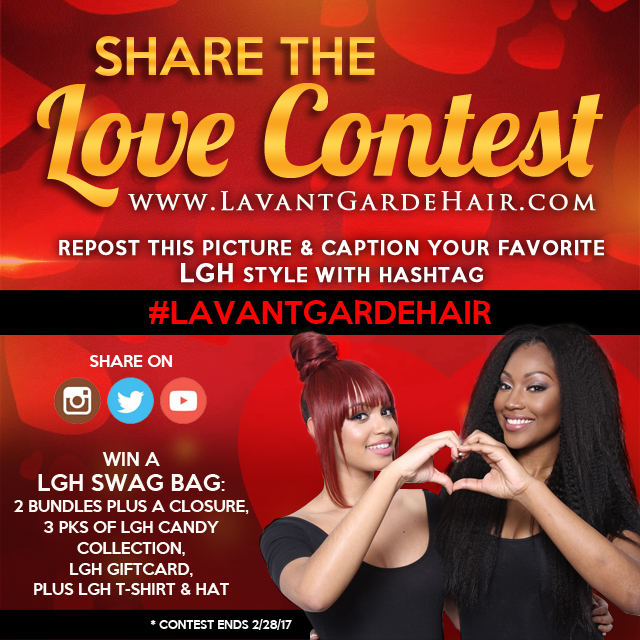 Legal residents of the 50 United States and District of Columbia (excluding its territories and possessions) only, at least thirteen (13) years of age are eligible to enter the L’Avant Garde Hair “Share the Love” Contest (the “Contest”). Contestants under the age of majority of their state of residence may be required to have their parent or legal guardian’s permission to enter as described below. Employees, agents or officers of L’Avant Garde Hair. (“Sponsor”) or of any entity involved in the development, production, implementation and distribution of the Contest, including, but not limited to, YouTube, LLC, and any advertising or promotion agency, supplier of prizes for the Contest, parent company, service provider, subsidiary or affiliate of any such entity or any other entity directly associated with the Contest or any member of the immediate family of and/or person living in the same household as such persons, are ineligible to enter the Contest. These rules apply only to legal residents of the Contest Countries. By entering the Contest, you accept and acknowledge that you are competing with individuals outside of the Contest Countries.